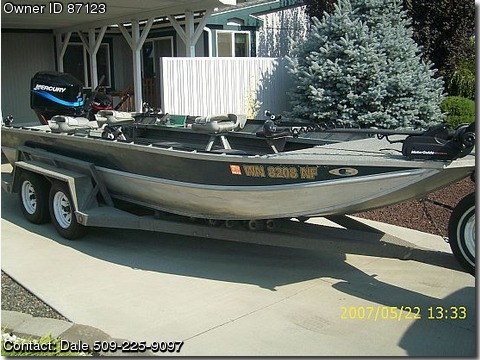 lowrance 510c new 2009, matching 2 axle trailer, fishbox, new tires, always freshwater, Custom built 1996 – 20' Koffler Jet Sled, 6 degree bottom, 2003 Mercury 115 hp tiller with 2003 Mercury 8 hp kicker. Fish box, wash down pump, bilge pump, front mounted 55 lb wireless electric motor. New 520C Lowrance color fish finder. Custom built galvonized tandom axel trailer, brakes on all four wheels, new 6 ply tires. Includes a pair of 10' composite oars for boondogging.